You might ask: Is there really some special national holiness? Is God not the same for all, is there not the same God for Russians, the French, Jews, and Greeks? Carefully reading the books of Holy Scripture, and especially the Apocalypse, and pondering of what the ancient monuments of all nations give evidence, of what world history and the history of each nation – including that of Russia – give evidence, one cannot but see that every nation has its own religious calling, which is materialized by its religious geniuses. Russia lit its lampadas for many centuries from their fire. Our Russian Orthodox lampada burned in churches, in monasteries, in rich and poor homes, in peasant huts… And it burned with the special flame of our particular Russian holiness. You might ask: Is there really some special national holiness? Is God not the same for all, is there not the same God for Russians, the French, Jews, and Greeks? “Be ye holy, even as your Father in Heaven” – this was said to all nationalities without exception. Do we not recall that it says in the Gospel that there is neither Greek nor Jew for the Kingdom of God? Of course, God is one, and the Church of God, the Church of Christ, is one for all; it is the “sacred vine” from which all people of the most varying nations and positions are nourished. But one sacred vine has many branches, brothers and sisters. Russian Orthodox holiness forms on this vine a particular branch of Russian Orthodoxy, of Russian Orthodox piety, a branch of Russian holiness. 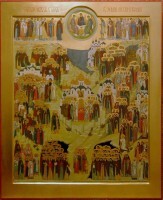 And today we celebrate with you the memory of all saints who have shown forth in the land of Russia. 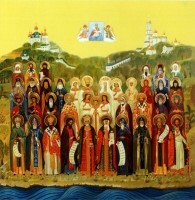 We do not only venerate our Russian saints as the heavenly patrons of holy and sinful Russia. In them we also seek revelation and instruction for the spiritual life of each one of us, for our own spiritual path. This is why we should know what the special feature of our Russian holiness is. Today we look with special feeling at our great past, in the countenances of our saints who appeared at the very source, in the very beginning of our nation’s history. Here is the eleventh century, the first Russian saints. Who were they? Laymen, brothers and sisters. The Passion-Bearers Boris and Gleb, and after them come the saints of the Kiev-Caves Lavra, headed by St. Theodosius, the spiritual head of this Lavra. Then we see holy princes and holy hierarchs. Then, finally, Muscovite Rus’. We see the saints of Moscow, who struggled near Moscow: St. Sergius of Radonezh, the Abbot of all Russia and Wonder-Worker, and finally our holy Northern Thebaid… Then Sts. Nilus of Sora and Joseph of Volokolamsk, who argued among themselves how about to organize monasteries and the monastic spiritual life. One says one thing, while the other says something else. And each one organized the monastic life differently, but both are saints and strugglers. After them come the fools-for-Christ, the blessed, and holy women: Euphrosyne of Polotsk, Anna of Kashin, and many other holy women who struggled in Russia. Finally, there are our near contemporaries, St. Seraphim of Sarov and St. Tikhon of Zadonsk. Here is a golden chain, stretching from our history’s very sources until our days. This gold chain has never been interrupted or broken. 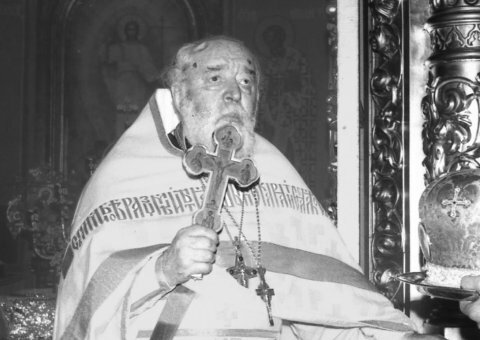 There was, is, and always will be in our land pure-hearted people who struggle in the holy struggle of our special Russian holiness and our special Russian piety. Let us peer into this golden chain, let us peer into this great past of the Russian Church, and what do we see? What features are characteristic of Russian holiness? We see above all, brother and sisters, we see the luminous dimension of life, that is, the absence of all kind of radicalism. There is no sharp deviation from the Christian ideals of monasticism bequeathed to us from antiquity, and we specially venerated, venerate, and will venerate monasticism. There are no cruel practices of some kind of special self-torture, there is no so-called austerity, but rather quiet labor and fasting, fasting and labor. So live our monasteries. Spiritual fatherhood appears in these monasteries. People living around the monasteries seek behind the walls of the monastery instructors of lofty spiritual life, going to them for comfort, consolation, support, and guidance. Thus spiritual fatherhood – not eldership, but namely spiritual fatherhood – arises in these monasteries, which as it were supersedes the spiritual fatherhood of parish priests: there, in the monasteries, people go to Confession more than here, in parish churches. Then eldership appeared in these same monasteries. The words of exhortation, the words of truth and instruction, flew from there, beyond the monastery walls, into the world – moreover, words of truth before the powerful of this world, and not simply before simple people. Nor did the monks of these monasteries reject literary work: nearly everywhere were created circles of scribes of sacred books, and not these only. Finally, in this simple monastic labor of cultivating the land, among many other household needs, there was yet another kind of special labor: the labor of iconography, which was quite remarkable, if one can speak that way of this unusually inspired art. But to what should we pay the most attention? What are the particular features of Russian holiness? 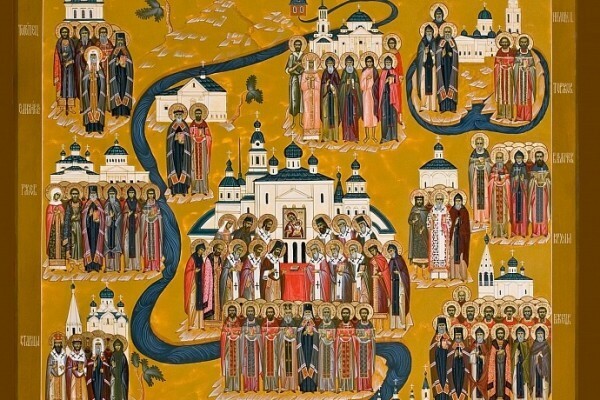 What ideals most inspired the Russian Orthodox Christian of old and until now? He was inspired, brothers and sisters, by the image of the humiliated Christ. It is this image that we find in the thin robes of St. Sergius, the Abbot of Radonezh; it is this image that we see in the angerlessness of this holy leader and, moreover, in his willing lack of power. He did not want to use his power over people, the power of the abbacy; before him stood a wondrous, wonderful image of humiliation: the humiliated and humbled Christ. This ideal inspired not only monastics, but also stood before the spiritual gaze of all Russian Orthodox people, and was always particularly dear to them. Thus, brothers and sisters, did there appear the holy laymen, the fools-for Christ. It was they, who struggled in this particular manner, who were especially inspired by the image of the humiliated Christ. There was yet another feature of Russian holiness: almsgiving. All our princes, holy hierarchs, and simply laity above all practiced almsgiving. “Be merciful,” that the Lord may be merciful to you. These are the particular features of Russian holiness, brothers and sisters, to which we should pay attention for our spiritual benefit. This is the flame of ideals that always burned in the lampada of Russian Orthodox piety. This lampada burns as before, just as in our churches, in the homes of the faithful, in cities large and small, in the provincial wilderness, and among the noise and din of modern civilization tread on their holy path the blessed, the venerable, the wanderers, the fools-for-Christ, the pure-hearted holy righteous ones, the unmercenaries, and the unseen ascetics of love. Thus, all around us, mircles are performed by their holy prayers and intercessions. And by the power of this miracle of God, taking place even now, may we all be strengthened on the paths of this Christian life and spiritual work leading to the Heavenly Kingdom and God Himself. Amen.